21 Comments on "My Easy One Bowl Chocolate Cake"
I wish this cake wasn’t so easy to make and delicious to eat. It’s my go to now. It lasts maybe a day. I love it! I love all your recipes I’ve tried so far. My son especially loves the wheat bread. I also am jealous of your spatula collection! 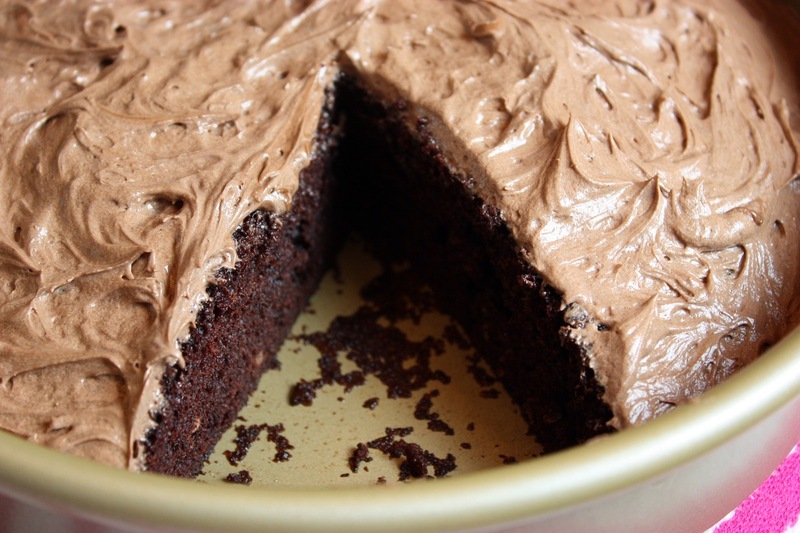 the easy chocolate cake Can I us GF flour in this recipe? Can I use Splenda instead of sugar? Sorry, I have no experience with either one. Hello, my question is, could you use Buttermilk instead of the lemon/vinegar and water combination? Thank you for sharing those great recipes, always seem to make sense and work well. I made this cake and he is so good and you’re other recipies also! Whe are real fans of you en eat a lot of you’re recipies here in Belgium! It might help to know that with any category of recipes, the newest one is always first at the top left. Just made this cake, it turned out great! I used a 8″ cake pan and used vinegar not lemon. Left it in the oven a little over 35 mins. moist and delish. Hi!Jenny I’ve been trying this recipie over & over again,thank you. I tried this recipe today, and it turned out great. Thanks for sharing, Jenny! I’d like to share my experience, and hopefully it’ll be useful for others. 1. I didn’t modify the recipe. 2. I baked for 25 mins, 350 F (175C). The taste of the cake was great, but the center part was not done. There was a cracked in the upper part of my cake, that’s why I decided to bake only 25 mins). I used spring-form pan. 3. I think every oven does have slightly difference, so we need to decide whether to follow exactly what the recipe says or to modify it. Using a springform pan and reducing the baking time is a bit of a modification and sometimes that’s all it takes for things not to turn out perfectly, especially if the springform pan is not 9 inches. I make this cake often and I can guarantee that if you follow this recipe exactly, with no changes at all, you will have a good result and the cake will never crack. There are several reasons why a cake can crack on the top. 1) The oven is too hot. 2) Using a smaller pan than indicated. 3) Too much rising agent. 4) Over-mixing the batter, which incorporates too much air in the batter. Baking soda is used in lots of baking and I doubt if that’s causing the bitterness. It might be from the cocoa you are using. Can you let me know the brand of cocoa and if you made any changes, even the slightest change, to my recipe. I’ve been making this cake for years and it’s never bitter. Please let me know, thanks. I just made your chocolate cake. Waiting for it to cool…..smells HEAVENLY! ! Do you suppose I could make a white version of this cake if I omit the cocoa and add flour? I truly appreciate all of your recipes! Can I substitute the vinegar with something else like lemon? I have only made it with vinegar but I’ve seen similar recipes that use lemon juice. Celebrating our 45th anniversary tomorrow……with an “empty nest” now, this is the perfect size, ingredients and flavor, and I have all the ingredients on hand. Love your thoughtful and delicious recipes. Thanks for sharing.